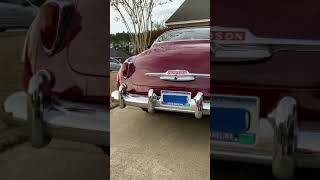 Hi, I am interested in your 1951 Hudson Commodore listed on Autotrader for $60,000. I'd like to get more information about this vehicle and confirm its availability. Straight 8 Cylinder, 128 HP. 3 speed on the tree. Garaged, restored to original complete condition. Original drop down chasis. Restorations fully documented with records pictures and documents. All restoration completed at an authorized Hudson restoration facility, Wildrick restoration LLC located in Shelbyville Indiana. Over 60K invested in this Commodore. Motor overhaul and rebuilt Runs smooth, transmission, rear end, and carburetor rebuilt. New drum brakes, radiator, gas tank, water pump, wet air filter, and battery. 12volt conversion, electronic ignition, new belts, hoses, new white wall tires. Original working dash. Fully restored interior. Beige and brown suede seats, carpet, door panels, headliner, and weather stripping. Original owners manual and service manual. Exterior paint may be original (unknown). Also has windshield awning which was added. All original trim, manual turning antenna. Roadworthy! All doors shut and seal, all lights work to include turn signals. Restorations still needed are the original radio which it has but not restored, and a wiper motor. Title in hand. Any reasonable offers will be considered.